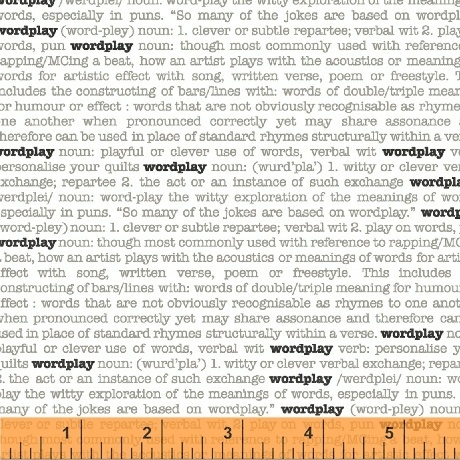 Word Play was inspired by designer Sarah Fielke�s love of reading, of words themselves and most of all, her love of words in quilts! She has always loved to use piecing and applique to incorporate words and phrases into her quilts, and what better way to bring in a touch of modern than with a text fabric. Word Play is fun for piecing quilts and makes unique applique shapes and backgrounds, and its also wonderful for word themed project bags, library bags and kindle covers. 21 skus. On Sale August 2017. Delivery to stores December 2017.